There’s disagreeing with your hired driver about which route to take, and then there’s driving around for two hours and stopping in an abandoned lot before finally getting home. 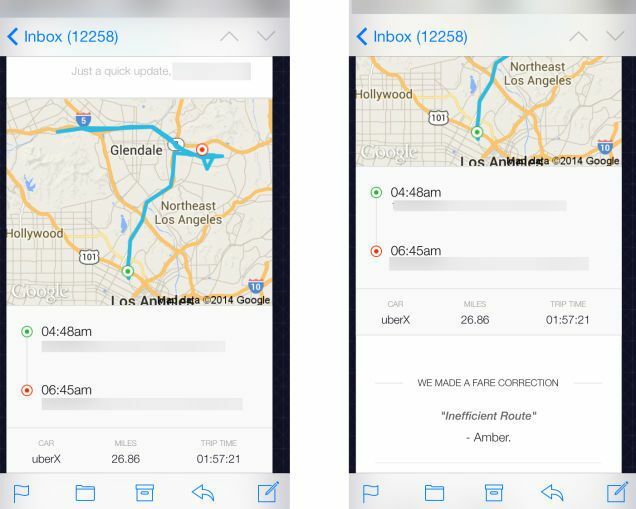 One Uber customer in the Los Angeles area claims she was briefly kidnapped during an extended trip home that should’ve been relatively quick. Instead, as she told Valleywag, her early morning ride after a party this weekend took two hours, during which time she says her driver ignored her directions and questions, and wound up stopping in an abandoned lot. The route meanders about 20 miles out of her way, stopping in a dark parking lot in the middle of the night. She says she protested and tried to get out of the car, but that the driver locked her inside. When she started screaming, he finally brought her home, she says. When she told Uber her story the next day, she says she only got an automated email reply, calling the whole thing an “inefficient route” and refunding part of her fare. A day later, the remainder of her fare was refunded. Nothing was said of her claim that she was briefly kidnapped. Uber says in a statement to The Verge that the reporting of that night’s events has been “inaccurate,” claiming the passenger was drunk and the driver was the one who needed help. The woman has reportedly involved the Los Angeles Police Department and is consulting an attorney.